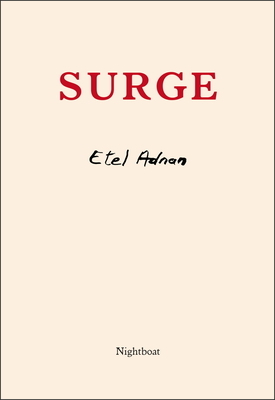 A new volume of aphoristic prose and philosophical poetry from Etel Adnan, whose work The New York Times recently described as the "meditative heir to Nietzsche's aphorisms, Rilke's Book of Hours and the verses of Sufi mysticism." She writes: "Reality is messianic/ apocalyptic/ my soul is my terror. Etel Adnan was born in Beirut, Lebanon in 1925. She studied philosophy at the Sorbonne, U.C. Berkeley, and at Harvard, and taught at Dominican College in San Rafael, California, from 1958-1972. In 1972, she returned to Beirut and worked as cultural editor for two daily newspapers. Her novel Sitt Marie-Rose, published in Paris in 1977, won the France-Pays Arabes award and has been translated into more than ten languages. In 1977, Adnan re-established herself in California, making Sausalito her home, with frequent stays in Paris. Adnan is the author of more than a dozen books in English, including Journey to Mount Tamalpais (1986); The Arab Apocalypse (1989); In the Heart of the Heart of Another Country (2005); and Sea and Fog (2012), winner of the Lambda Literary Award for Lesbian Poetry and the California Book Award for Poetry; and Night (2016). To look at the sea it to become what one is, a two-volume collection of writing, was published in 2014, the same year she was awarded France's l'Ordre de Chevalier des Arts et Lettres. Her poems have been put to music by Tania Leon, Henry Treadgill, Gavin Bryars, Zad Moultaka, Annea Lockwood, and Bun Ching Lam. Exhibitions of her paintings have been mounted at The CCA Wattis Institute for Contemporary Arts, San Francisco; Museum der Moderne Salzburg; Mathaf: Arab Museum of Modern Art, Doha; and the Serpentine Galleries, London.